So that quote above can only mean one thing. Nooooo, I didn’t almost lose my kids at a water park again. It means we did Lilo & Stich night, dummy. Now please, the last time I saw my kids they were at the big slide over there and I was ordering a margarita. Let me know if you see them. Also, let me know if you see another margarita stand. Lilo & Stitch is a movie that, I don’t know, might not appear on a lot of people’s “Top WHATEV Disney Movies” list. It sort of fell in a weird time I think for Disney studios. Pixar and to a lesser extent Studio Ghibli were quickly becoming the go-to houses for churning out quality films while Disney was for the most part giving us cruddy direct-to-DVD releases of sequels no one was asking for (Return to Neverland, Jungle Book 2) or struggling with some of their original releases (from the underrated Atlantis and Treasure Planet to the “ugh let’s not mention it ever again” Country Bears.) So honestly, I think it suffers more from when it was released than anything else. When the movie was released, Disney really did seem more focused on quality in its live-action features such as Princess Diaries, The Rookie and the first Pirates movie to be released a year later. 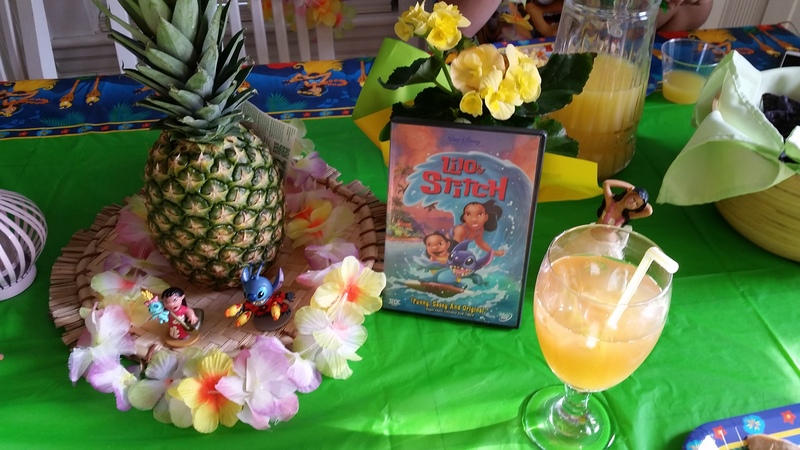 So often, I think those who were not children at the time of its release (and thus watching whatever was put in front of them) kind of push Lilo & Stitch to the side as a film that can probably be ignored or one that can be lumped into what some view as a darker period for Disney. In fact, this night we were joined by a few L&S doubters of our own. Our next door neighbors the Chagnons (George, Steph, Courtney and Emily) joined us for the movie. Two of them had never seen the film (at least in its entirety) and two of them said they didn’t really like it. I won’t mention names but ok yes I will. Steph and Courtney were the two that said they didn’t like it. So obviously, we were on a mission to convince these doubters they were wrong. Did we succeed? You’ll have to read on to see. The suspense is delicious. Man I have already used a plethora of parentheses in this post (it’s a good way to offer depth without sacrificing form). 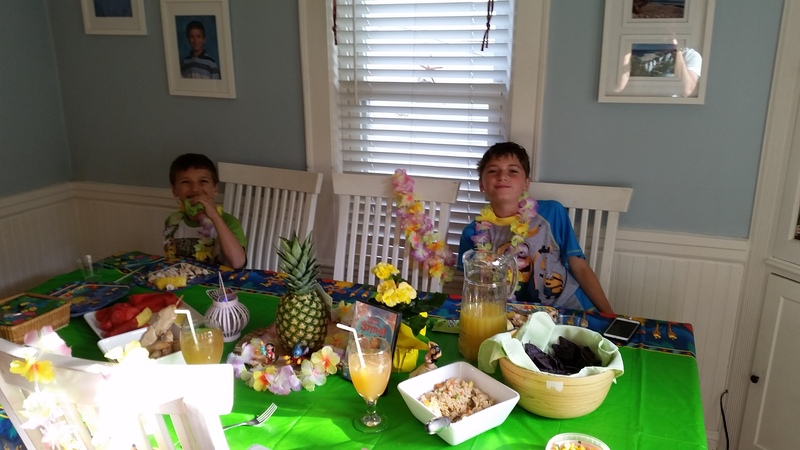 The Changnons didn’t make it over until dessert so it was just the four of us for a little Hawaiian luau of sorts. We had chips with pineapple salsa, chicken skewers, chicken fried rice, pineapple and watermelon. And the kids had Stitch juice to drink. And for dessert (with the Chagnons (please note, yet another use of a parentheses…In fact a parentheses inside a parentheses? Amazetown)) we had coconut cake. 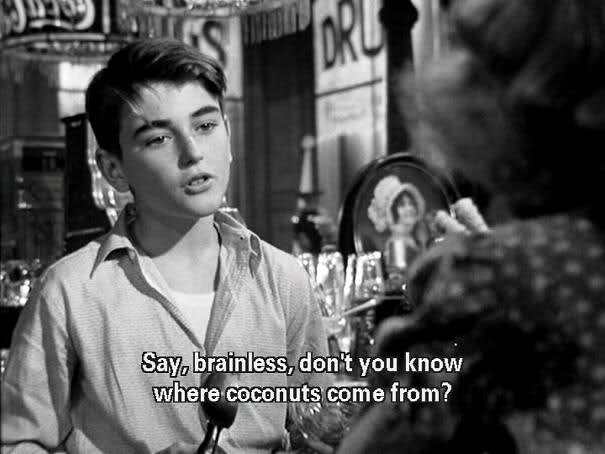 Seriously, I cannot even hear the word coconuts without thinking of It’s a Wonderful Life. THIS is how my mind works. 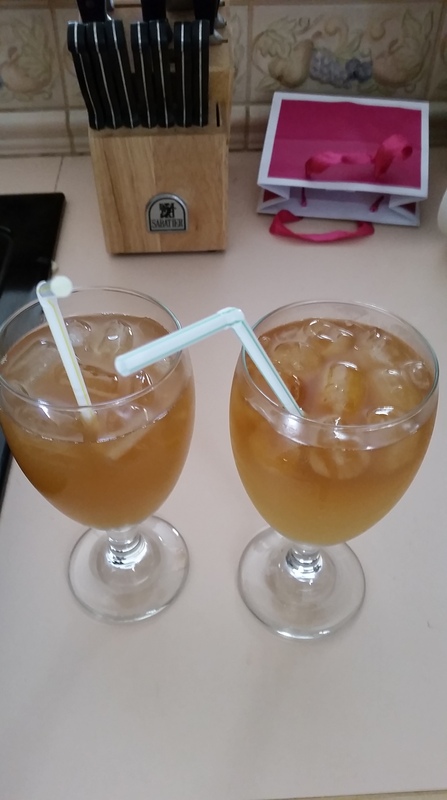 And of course we had mai tais. Because, I mean, rum. You want some? No, those are my tais. Well, there were two activities sort of. While we were waiting for the Chagnons to arrive, the kids decided they wanted to participate in a very popular activity as of late. They watched a few episodes of The Office. They have been going through every episode from the beginning. 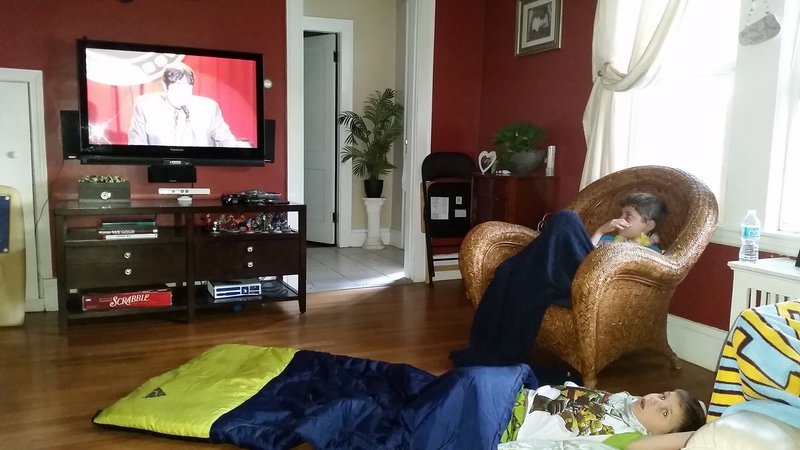 “What kind of parent lets their kids watch The Office?” Please refer back to my margarita-fueled water park abandonment story for your answer. 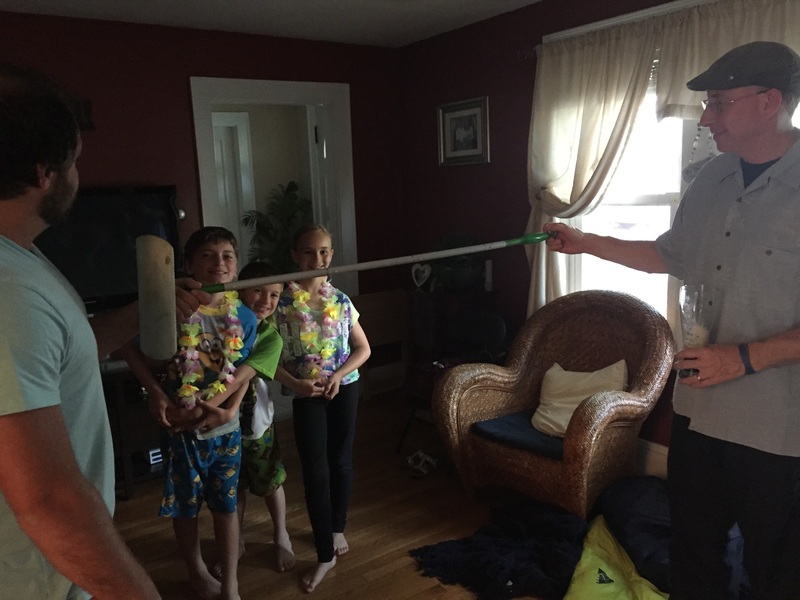 For the “real” activity, we did some Swiffer limbo. Yeah. Swiffer limbo. George and I held the Swiffer while Myles, Owen and Emily tried to make their way under it. The winner? Emily. Because, according to Myles, he and Owen are not gymnasts. Neither is Emily, but still…Myles and Owen are not. The more you know. Swiffer limbo. Because we like good CLEAN fun. Get it? See what I did there? Is this thing on? But gosh darnit all to heck, it works. And I think it works well. Yes, I do love Stitch as a character (and I MAY own a Stitch pillow pet) and Lilo has has some funny lines. And the Elvis-based soundtrack is pretty great. And I mean, come on…who doesn’t like orphans? But really – there are two core pieces to this story that make it one of my favorites. For one, this story focuses on something obviously very important to me, family. No matter how dysfunctional or broken your family is, they still yo family. In the movie, both Lilo and Nani are struggling. Nani is struggling to transition from sister to mother after the death of her and Lilo’s parents. And Lilo is lashing out as she is also in a transition period, forced to move on from her feelings of loss probably quicker than she needs to and accept her new life. But regardless, they are family and obviously love each other. Then comes Stitch. Thought initially to be a dog, he pretty much wreaks constant havoc on their already tumultuous life. 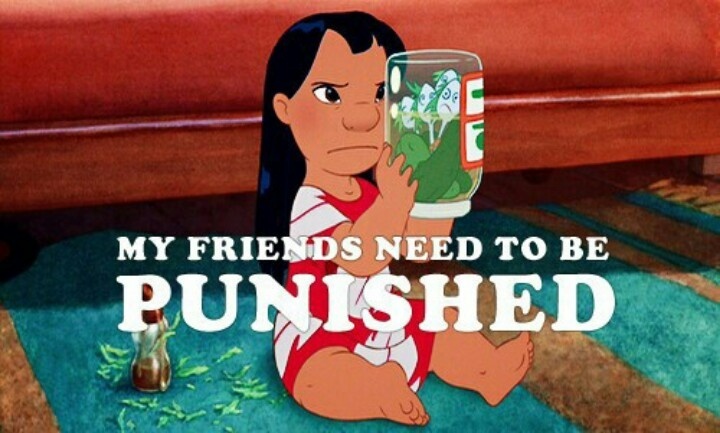 But I think Lilo sees in Stitch a little bit of herself. I think she hopes he isn’t bad, just misunderstood. Probably a lot of what she feels. And she immediately brings him into their family. So now, regardless of how things play out, they are stuck with each other. And now, I would like to pause so Nickie can reflect on how she feels about our pet rats. The other piece that I think works really well here is the old story of redemption and the role of love in one’s road towards it. Stitch is programmed to do one thing. Destroy. But through Lilo’s love and his experience with her broken but ultimately loving family, he starts to move past his original programming and starts to see what is really important in life. And this realization is what moves him to perform his act of redemption – saving Lilo and bringing her back to Nani. On my list of 40 movies, I wouldn’t say Lilo & Stich ranks in the top ten or anything, but it definitely deserves a place in the overall list. It has some things that set it apart from other Disney classics but that’s not necessarily a bad thing. Oh and I think we won over the Chagnons, so that’s good. And for the record, I never really lost my kids at a water park. That looks like a fun party! This is a movie that has grown on me. The more I watch it, the more I like it. I love that it is about a little girl and she feels real and unique. I love the relationship of the sisters and the message of ohana. I love the Hawaii setting and the watercolor look. I still do not love Stitch. He’s too mean and destructive especially to characters that are down on their luck. Plus I still think he looks like a cockroach. Agree on pretty much all your points here. I actually never commented on the setting or look but you’re right. It’s got a very good overall look and feel to it. But I don’t know. I kind of love stitch. Mainly because he is fighting against some tough stuff. He is programmed to be destructive but this experience is forcing him to fight his way out of it. And I think he becomes pretty lovable. Yeah I still finding myself I could exise Stitch from the movie and have it just be about the sisters and their struggles. Still like I said it has steadily grown on me and I like it more everytime I see it. I have a special place in my heart for Hawaii so I love the setting and culture. There are actually very few Disney movies that are about children (Meet the Robinsons, Pinocchio, Sword in the Stone…) so I love the fact Lilo is a such a great little kid. Not an adolescent as most Disney films.